Update: The new locale was committed to glibc and should be part of glibc-2.24. American English spelling is more common in Israel. The metric system is used, along with the relevant paper sizes (“A4” instead of Letter). Dates are written in dd/mm/YYYY format, unlike in the USA. The first day of week, and also the first workday is Sunday. The currency used is ILS (₪). So, up until now users had to choose locales such as en_US or en_GB and compromise on some stuff. To solve this issue, and create a truly suitable English locale for Israel, I wrote a localedef file for the en_IL locale. Now, complete the installation by running dpkg-reconfigure locales and enable en_IL.UTF-8 from the list, and set it as the default locale. This entry was posted in Linux, Tips and tagged Debian, Hebrew, Ubuntu on April 16, 2016 by Guy. You may need to adjust the paths for TryExec, Exec and Icon to match where you installed Calibre. This entry was posted in Tips and tagged Calibre, GNOME, Ubuntu on February 13, 2015 by Guy. The system my have suffered a hardware fault, such as a disk drive failure. The root device may depend on the RAID devices being online. This entry was posted in Linux, Tips and tagged Errors, mdadm, RAID, Ubuntu on November 16, 2013 by Guy. This entry was posted in Tips and tagged Calibre, GNOME, Ubuntu on September 28, 2013 by Guy. Credit for this part goes to Alan Burton-Woods. These steps got Citrix working for me, but your mileage may vary. This entry was posted in Tips and tagged Citrix, Errors, Ubuntu on December 22, 2012 by Guy. I came across not-so-expected behavior in nameref, the package responsible for creating named references, when used in conjunction with theorem environments such as the one provided by amsthm. For example take a look at the following LaTeX document. You would expect the named reference to refer to the theorem’s name. However in reality it refers to the section’s name. This entry was posted in LaTeX and tagged LaTeX, Ubuntu on December 15, 2012 by Guy. 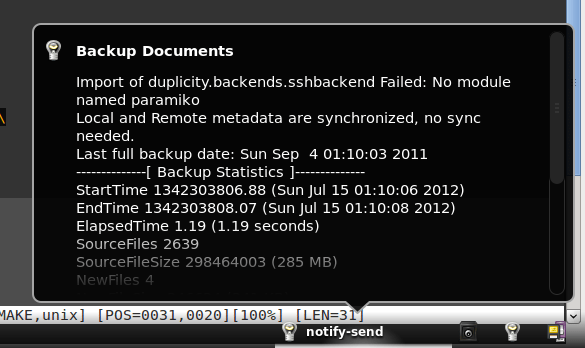 Usually when one wants to keep track of one’s cron jobs, one tells the cron daemon to email the output of the commands. While this is probably the best solution for servers, on desktop machines is problematic. Many ISPs block outgoing traffic on port 25 (SMTP), and if you want to send the emails via external SMTP server (such as GMail) this requires you to store authentication details in plain text. A better solution for the desktop would be to harness the desktop notifications available in Ubuntu. notify-send expects its input on the command line, it can’t read from stdin. If you run from cron you must tell it which display to use. 10 1 * * sun some_cool_command | notify-send "Backup Documents" "$(cat)"
DISPLAY=:0 10 1 * * sun some_cool_command | notify-send "Backup Documents" "$(cat)"
The first argument to notify-send is the title of the notification. The second is the actual text to appear in it, in our case it’s whatever comes in the stdin. If you want to store the output in a log file as well as displaying it in a desktop notification, you can use tee, which basically saves its input to a given file and also pipes it again to stdout. 10 1 * * sun some_cool_command | tee -a ~/some_log.log | notify-send "Backup Documents" "$(cat)"
DISPLAY=:0 10 1 * * sun some_cool_command | tee -a ~/some_log.log | notify-send "Backup Documents" "$(cat)"
This entry was posted in Linux, Tips, Tutorials and tagged Ubuntu on August 17, 2012 by Guy. After you upgrade your python/distribution (specifically this happened to me after upgrading from Ubuntu 11.10 to 12.04), your existing virtualenv environments may stop working. This manifests itself by reporting that some modules are missing. For example when I tried to open a Django shell, it complained that urandom was missing from the os module. I guess almost any module will be broken. (depending on how you created it in the same place). All the modules you’ve already installed should keep working as before (at least it was that way for me). This entry was posted in Python, Tips and tagged Python, Ubuntu, virtualenv on May 30, 2012 by Guy.